People should know what size of tire is correct for their vehicle. However, many don’t. 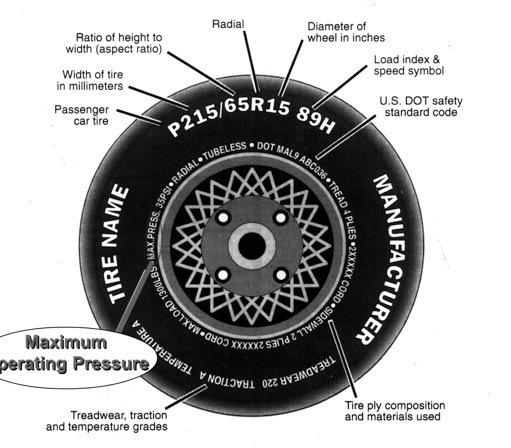 Drivers need to know the tire width, aspect ratio, and wheel diameter. The information in the tire sizes guide immediately below can help people identify the right tire size for their vehicle. One of the first things you should do is check out the information on your vehicle’s existing tires. There should be a tire size branded on the tire sidewall. This information can tell you about the tire’s purpose, dimensions, load capacity, and its durability in terms of temperature and speed. This information is indicated through a series of letters and numbers. For instance, passenger vehicles almost always will have a tire that has a series of letters and numbers, which starts with the letter “P.” This, of course, stands for a “P-metric size” and is intended for a “passenger vehicle.” These can be cars, sports utility vehicles, minivans, etc. These types of vehicles normally have a quarter to a half-ton load capacity. These are the most common types of tires in use today. You will need to let the person changing your tire know this information.